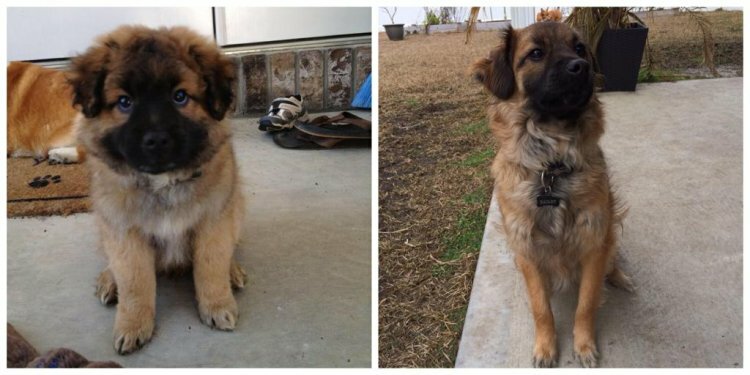 Is this a Chow Mix? NO. This is an AKC show quality Golden Retriever waiting his turn to go into the show ring to be judged. Labrador's tongue mean he's really a Chow mix? That mixed breed puppy in the shelter with a partially black tongue - is that a sure sign he's part Chow? The answer to both questions is: No! The Chow Chow's blue-black tongue is one of the breed's most well known physical characteristics. It's also the most misunderstood. The Chow is one of the most ancient breeds and is the ancestor of many breeds of today. The orgin of the Chow's black tongue is a mystery; we don't know how or why he came to have it. We also know that blue-black spots on tongues are very common in dogs - more than 30 pure breeds are known to have members with spotted tongues. Spots on tongues are simply deposits of extra pigment, like birthmarks and freckles on people. Dogs often have spots of dark pigment on their skin, too, hiding under their coats. These spots can be large or small, many or few. If a Chow's tongue has a pink spot on it, does that mean it's not purebred? No. Chow puppies' tongues are pink at birth. They darken to blue-black by 8-10 weeks of age. Some tongues don't cover completely and they may have small spots or splashes of pink. Elderly Chows and Chows with the dilute coat colors of cinnamon and blue sometimes lose tongue pigment as they age and develop pink spots. What if the dog looks like a Chow but has a completely pink or mostly pink tongue? Knowledgeable Chowists agree that such dogs are not purebred Chows and might not have any Chow parentage at all. The Chow is a member of the spitz family, a large group of breeds that includes the Samoyed, Siberian Husky, Malamute, Akita, Shiba Inu, Pomeranian, Norwegian Elkhound, Keeshond, etc. They all share basic physical characteristics: a similar body structure, over-the-back tail carriage, upright triangular ears, and a dense offstanding coat. A Chow-looking dog with a pink tongue is more likely to be a mix of one of the other spitz-type breeds.